Need an idea for a gift? Alabama made it two Iron Bowl victories in a row over Auburn. 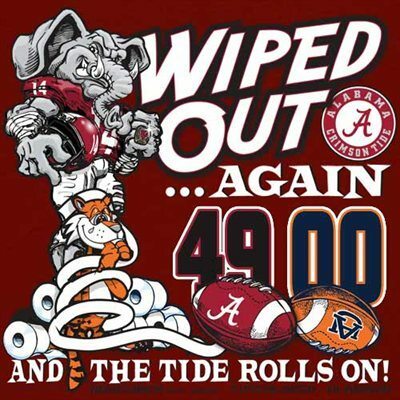 Why not remember Alabama 49 Auburn 0 with a shirt or tee? Here are a few Iron Bowl Score shirts and T-shirts. Details: The Tigers didn’t seem to get it the last time around, so your Tide had to teach them a lesson again in the 2012 Iron Bowl. 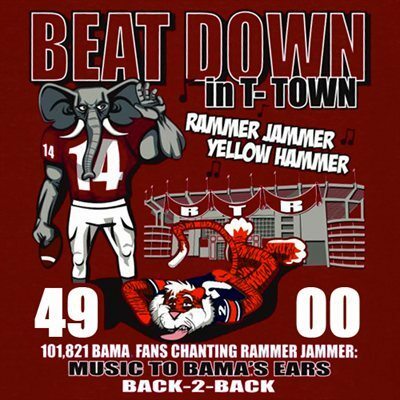 Show your pride for the Crimson Tide after they stomped over the Auburn Tigers with this Score tee. It features a Bama Iron Bowl logo printed at the left chest, while the game’s final score and a large graphic of Al towering over poor lil’ Aubie decorate the back! Shirt available in Small, Medium, Large, XXL, 3X, 4X and 5X. Click here to see more about the shirt. Details: It features a Bama Iron Bowl logo along with “Back 2 Back Champs” lettering printed at the left chest, while a team logo, the game’s final score and a large graphic of Al towering over poor lil’ Aubie decorate the back! Two versions including a long sleeve option. In the coming days look for additional gift ideas for the Alabama football fan on your holiday shopping list. Separator image Posted in Alabama Fan Gift Guide. Would you happen to have any shirts on the LSU game? ?